Special: get "End of Days"
MILLENNIUM: THE LORD REIGNS is an awesome and inspiring preview of the Lord’s majestic millennial reign. Author David Dolan takes many of the characters from his best-selling first novel, THE END OF DAYS (Fleming Revell, 21st Century Press), into the future thousand year reign of Yeshua the Messiah from his glorious throne in Jerusalem. Set mainly in the Holy City, and also in the Greek Isles and the United States, it vividly portrays the contrast between the redeemed glorified saints—worshipping their Conquering King while also governing the restored world with Him—and the fallen human beings who survive the tribulation upheaval or are born during the Lord’s magnificent millennial reign. As the human population grows to outnumber the eternal saints, the need to employ the “rod or iron” foretold in Revelation 19:15 grows as well, especially as the last days of earth approach. Two sisters from the previous era, one a hallowed saint and one an unrepentant sinner, clash fiercely as the centuries draw on, with the sinner mothering a child that would play a major role in earth’s final showdown between good and evil. 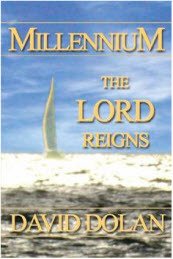 Dolan’s companion futuristic prophetic novels are unique in several ways. 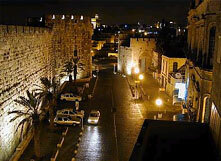 For one thing, they were written in Jerusalem, where the author has worked as a journalist for 30 years. They display his intimate knowledge of the Holy City and Jewish culture gained during that time, and also of the Greek Isles (in Millennium) where he has spent many summer vacations at a friend’s cottage. They also combine his “factual” news writing style (working for CBS, CBN and many others media outlets over the years) with his longtime interest in apocalyptic biblical prophecy. END OF DAYS was an international best seller, being published in several English editions and eight foreign languages, the latest US edition in 2005. Many readers have been eagerly awaiting this long anticipated sequel novel. Best of all, the main character in it is Israel’s Merciful Messiah, now enthroned as ruler of the MILLENNIUM, the awesome time when THE LORD REIGNS over all the earth from restored Jerusalem! Jonathan and Sarah Goldman and their earthly children and friends descend to the Mount of Olives in Jerusalem with the Conquering Messiah, Yeshua, the Master of the Universe. Now living in their eternal bodies, they begin new lives in the Millennium—the thousand year reign of the King of Kings centered in the Holy City, which is supernaturally transformed as King Yeshua’s benevolent rule begins, spreading out from Israel to the rest of the recovering world. While celebrating the Lord’s everlasting reign in the Jerusalem Temple, Jonathan and Sarah are reunited with saints from all the ages, including some family members they did not expect to see in glory. Sarah also discovers a human survivor from the passing era who would change her life and the course of millennial history. Many of the redeemed saints, including Jonathan’s son Benny, and his close friend Eli Ben David, are soon sent out to rule earth’s small human population; mostly children who survived the end-time tribulation. Among the survivors is a baby who would later play a pivotal role in the amazing millennial age. The drama increases as human beings—still displaying free will and sometimes open rebellion against the Lord’s peaceful rule—grow larger in number than the saints governing them. This leads to an increasing need for millennial officials to employ a “rod of iron” as prophesied in the book of Revelation. As the contrast increases between the Shining One’s majestic rule and the darkness of defiant human sin, the Millennial Kingdom rushes to a final showdown that pits two family members against each other in a dramatic clash of titanic proportions.